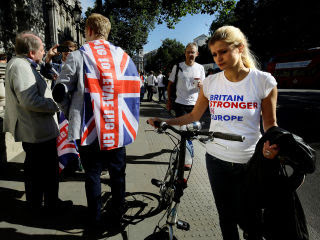 A divided country: young pro- and anti-Europe supporters on the street. Divided Kingdom: The Brexit vote showed the thin cracks in British society. As hairline cracks sometimes do, they suddenly widened with the Brexit vote. We saw a picture of a country divided. Well, actually it is not one country at all, any more, I would suggest. 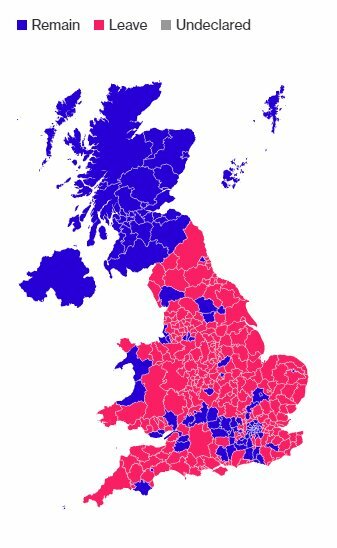 There is England (leave), Wales (leave), Scotland (remain) and Northern Ireland (remain). Apart from these obvious splits, there are others. The “native” English (whoever they are) and the immigrants; by the way, over seventy per cent of black Britons voted to remain. The older generation (who voted to leave) and the younger generation (who voted to remain – they are still building their lives). The Londoners (who have probably benefited most from the EU) and the rest of England and Wales (who are not enjoying an economic boom) – in other words, the have’s and the have not’s. The political elite and the ordinary man/woman on the street, who feels the elite is not in the least interested in his/her plight (and they would be right). 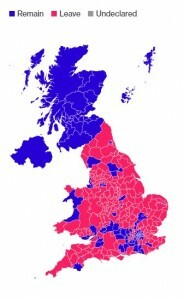 Last but not least, we must not forget the good old British class divide: the less well-educated working class in small towns and the less prosperous, former industrial zones of the north of England, and the university-educated, socially mobile, diverse and sophisticated middle class Londoners. None of this is anything new. Not even UKIP’s Nigel Farage was convinced the “leave” vote would win. Half way through the night he predicted the UK might well remain. Failure of Leadership: Yet, Britain’s inept political leaders (on both sides) failed to read this mood of the people. They were so swept up with their politicking and point-scoring, carried away on waves of exaggerated claims and false rhetoric, they just weren’t listening. 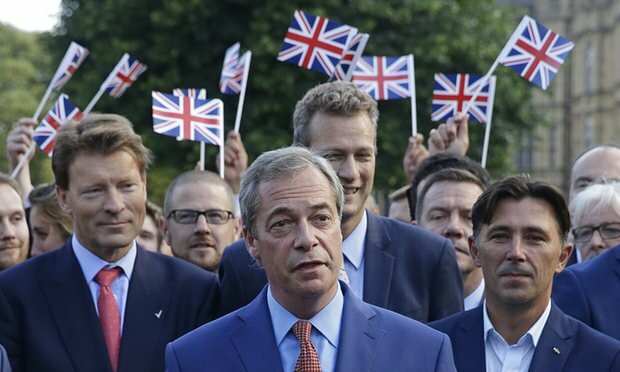 There seemed to be a general assumption (even by the right-wing United Kingdom Independence Party) that Britons would vote “remain.” But, lo and behold… They didn’t. Now, the UK Government will likely remain weak and the people will not be united. Faceless Bureaucrats: In case the leaders hadn’t noticed, Britons’ undercurrent of resentment and suspicion of Europe has been smoldering for many years now – especially among the working class. Back in the 1970s, what was then called the “Common Market” seemed like a great idea; even Margaret Thatcher welcomed it. 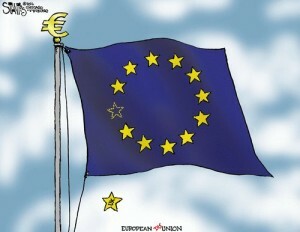 However, the EU bureaucracy became more and more bloated, as more countries joined. Rules and regulations proliferated. There was growing irritation among some Britons that the details of their everyday lives (what size bananas they could eat, etc) were being controlled by faceless, unelected officials in Brussels who were not held accountable. In other words, the EU was seen by many as essentially undemocratic. 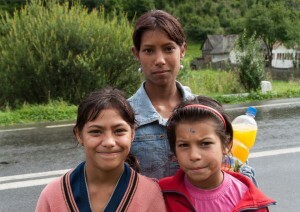 Three Roma girls in Romania. The Roma (often called “gypsies”) constitute one of the largest minorities in Romania. They have suffered from persecution, prejudice and discrimination in Britain and elsewhere in Europe for centuries. Immigrants Go Home: Racism and xenophobia have always been around – and sadly, will continue to haunt us. Unfortunately, since the Brexit vote the bigots have come out of the woodwork; they’re out in the open, at least for now. Much of the anger is directed at other European Union citizens, though: the Poles, Romanians, Bulgarians and so on. In two years, over one million East Europeans immigrated to the UK in search of work. They saw it as the land of opportunity, compared to their less well-off countries. Britain had to accept them as EU citizens. And yes, racism is not just about black vs. white; prejudice against East Europeans (including Jews), the Roma (gypsies) and other European groups has been around for many decades. Now, of course, the bigots see it as an opportunity to yell “Go home!” at anyone on the street who looks like a foreigner – including Africans, West Indians and so on. Austerity Blues: The 2008 recession hit Europe hard; it did not recover as well as the United States did. The gap between rich and poor has grown dramatically, and David Cameron’s era of economic austerity has not been a happy one. And, when times are hard, who do people blame? See previous paragraph. CARICOM-skeptics? We know about Euro-skeptics. What about CARICOM-skeptics, and are some Jamaicans among their ranks? What if we were to hold a referendum? Would we vote for a “CARexit”? The UK is falling off this flag. Will others follow? Or will Scotland replace the UK among the stars?